​Cliffe Castle Park in Keighley is being restored with funds from the Heritage Lottery Fund. 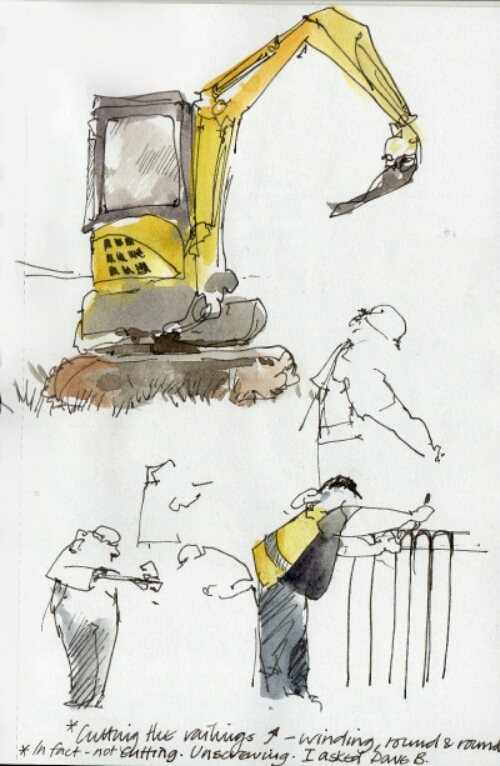 Work started on site in June and I’m following progress and sketching whenever I can. The site of the pond before excavation. Click on the picture to view a larger image. 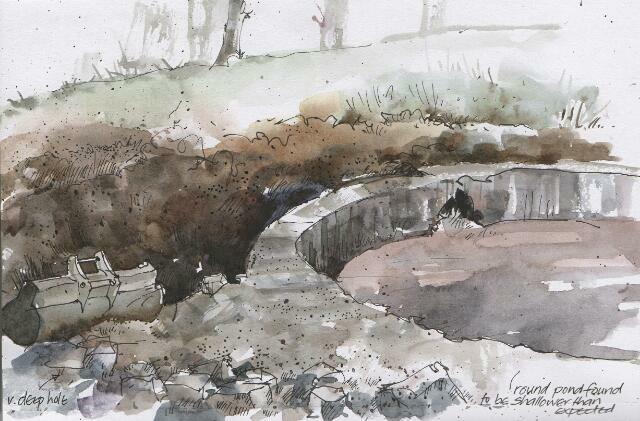 Work has begun on the site of the pond, and knowing it was going to start any day now I sketched a panoramic view of it before work started. It’s a long, lozenge shaped area and before any clearing or digging began only the shaped edging stones that formed the rim of the round pond gave a hint of what lay beneath. Just a few of these were visible, close to the path. 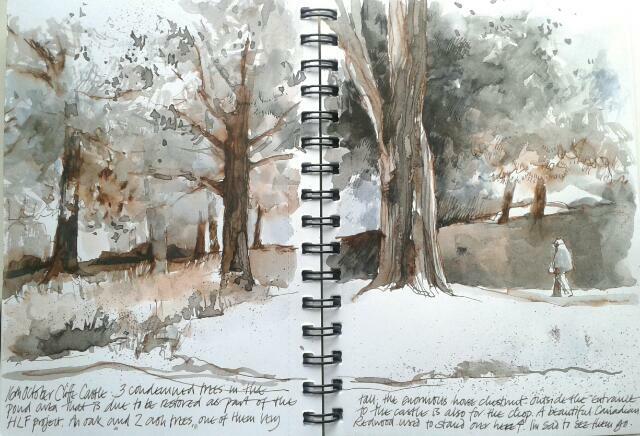 This is not the first time I’ve sketched this part of the park; in October last year I recorded the trees that were going to be felled as part of the conservation project and three of them stood here, on the site of the pond. There were others, including a redwood, that went earlier but unfortunately I missed the chance to sketch them before they came down. 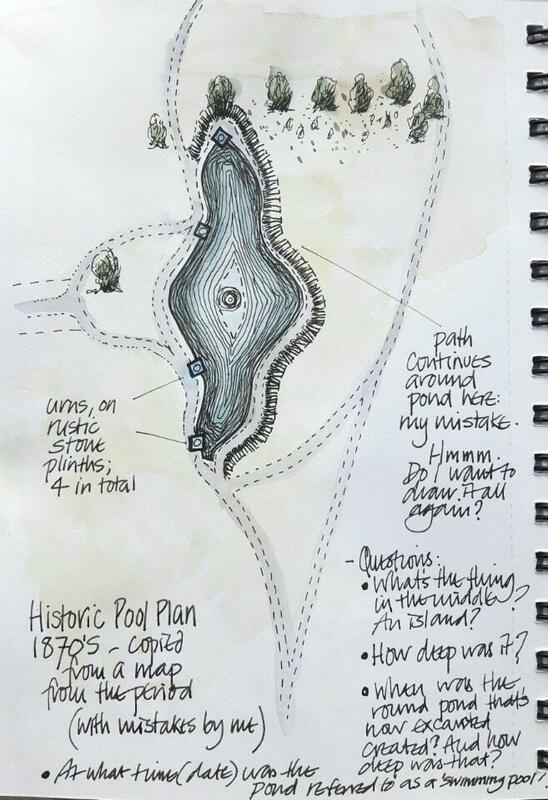 My understanding of the history of the pond is murky and incomplete – though hopefully it may become clearer over time. To get a better idea of what the site must have looked like at the time of the Butterfields I copied a plan from the 1870s in my sketchbook, and found myself with more questions than answers. It seems likely there was a fishpond here in the gardens of Cliffe Hall, the house that later became Cliffe Castle, and this pond was transformed into what was really a small ornamental lake around 1878, when the Butterfield family were doing an extensive programme of building, remodelling and landscaping. There was a fringe or border of large rocks mixed with decorative planting, and four magnificent carved marble urns on plinths that stood along the edge facing the house. (I’ve seen a photograph). Later only the central, round part of the pond was filled with water, and up until the 1950s this would have been deep as it was referred to as a swimming pool, but the whole structure fell into a state of disrepair and at some stage must have been partially filled in and made much shallower – to the depth that’s now been uncovered – which would explain why reminiscences include memories of people falling into it when drunk, or of children wandering into it, and not coming to harm (as far as I know). Please, if you have any stories you’d like to share, or if any of these facts need correcting – do leave a comment at the bottom of this post. The round central pond revealed – quite shallow but with the bottom intact and not broken up. The hole presently being dug out at the side of the round pond is going much deeper. 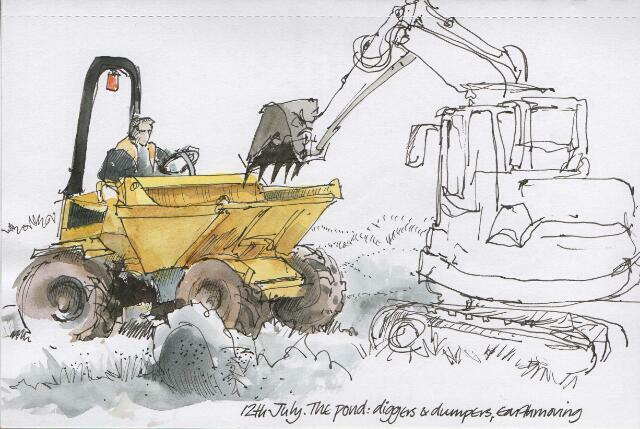 Excavation and removal of soil from the pond, with diggers and dumpers. The large shaped edging stones and the huge ornamental rocks that were used to construct the rock garden that filled in and covered the site in the 1980s have been removed for storage and conservation, and diggers and dumpers have been excavating. There’s a lot more to do here before the whole site is properly excavated and cleared and it’s fascinating to watch – and clearly visible as the work is going on behind wire mesh screens. It’ll be interesting to see what happens next! Postscript: this post was amended on the 15th August to include the sketch map with notes. More updates on the work of the conservation project, photos, plans, and background information at: https://m.facebook.com/Cliffe-Castle-Heritage-Lottery-Bid-304048249751094 and at the Cliffe Castle Park Conservation Group website. Sometimes demolition can be done very quickly, but not when you’re conserving things that are going to be put back together again. I spent some time last week watching the stones in this wall being carefully separated into piles and the dressed stone being neatened and cleaned before being stacked on pallets and taken away. 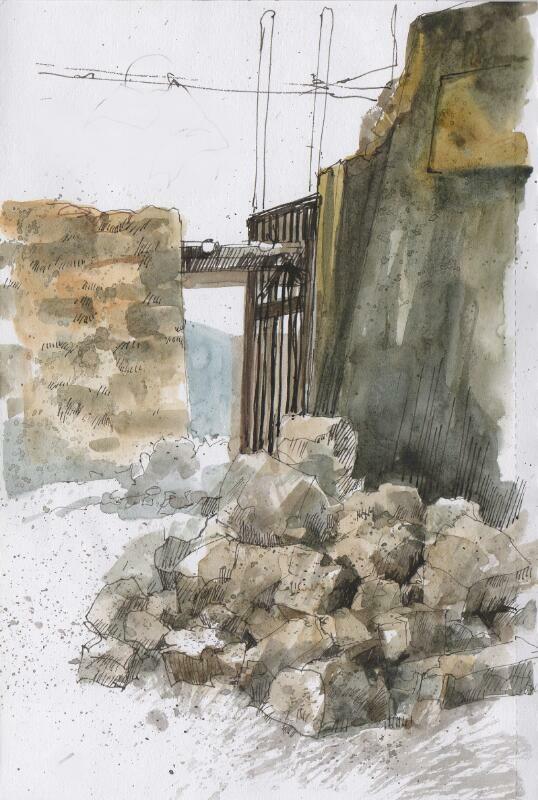 The wall has had to come down to give better access to the site; it’ll be reinstated, eventually, a bit further back. Even though it’s a slow and deliberate process, things can move amazingly fast – I’m constantly surprised by how much has changed from one day to the next. These drawings were from last week, when the weather was better; this week I’ve been dodging rain and haven’t managed to get too many good opportunities to draw. Cliffe Castle Park in Keighley is being restored with funds from the Heritage Lottery Fund. 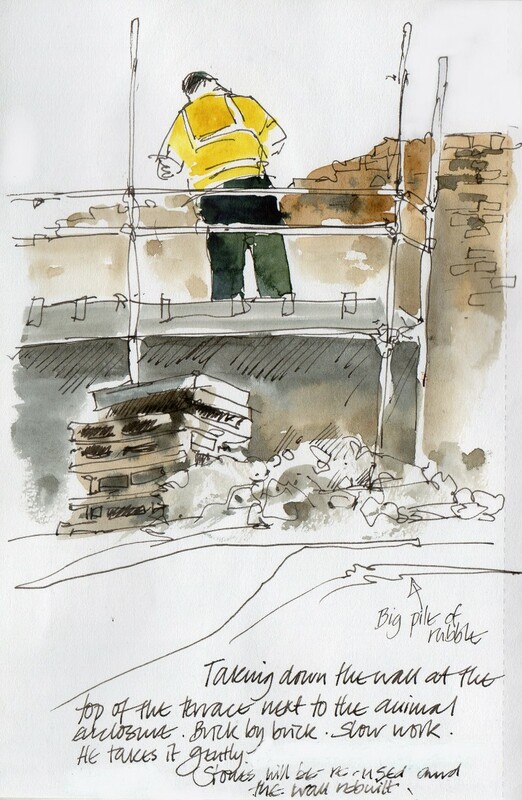 Work started on site in June and I’m following progress and sketching whenever I can. More updates on the work, photos, plans, and background information at: https://m.facebook.com/Cliffe-Castle-Heritage-Lottery-Bid-304048249751094 and at the Cliffe Castle Park Conservation Group website. At long last, work on the restoration project to restore and relandscape the grounds at Cliffe Castle is under way. 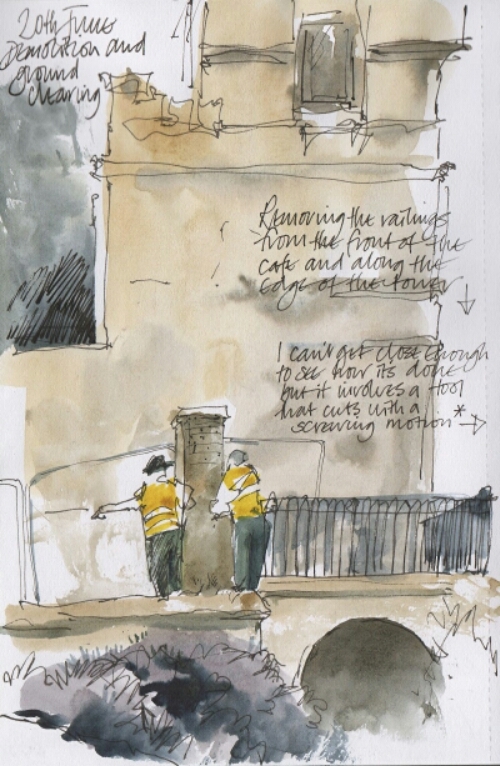 As I’m often prowling around up there with a sketchbook and do love watching what’s going on, I seem to have become a sort of unofficial Works Artist. Not that I can in any way do it justice – but I’m going to try to record as much as I can, and it’s wonderful drawing practice. Watch this space, and I’ll put up bulletins when I can.